Lake Garda attracts visitors from all over Italy and around the world with its deep blue water and diverse topography. Whether you’re traveling with family or looking for the adventure vacation of a lifetime, hotels on Lake Garda will not disappoint. Discover the medieval walled town of Sirmione, the bustling hubs of Riva and Bardolino and the sleepy local villages of Salo and Limone. Stunning, luxurious hotels can be found all over Lake Garda, providing access to one of Italy’s premier vacation destinations. 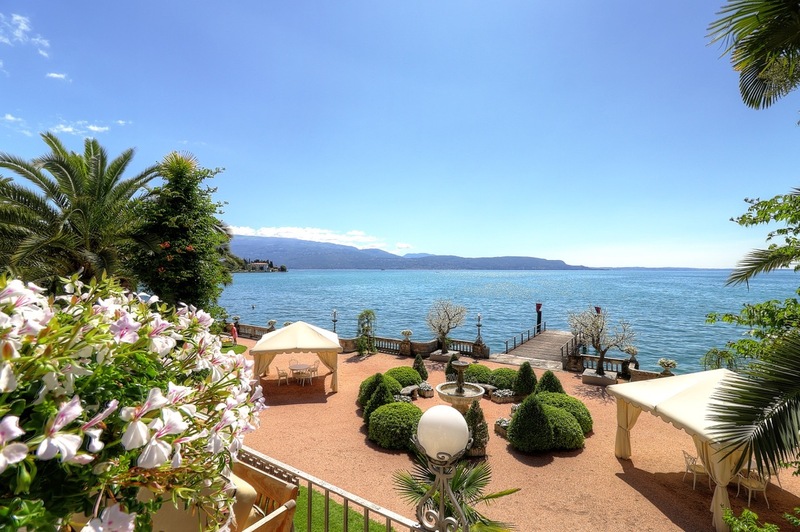 Lake Garda: hotels on the lakeshore, a mild climate, picturesque scenery and a stunning Alpine landscape. Italy’s largest lake is one of the most popular destinations in Europe for a reason. © Hotel Du Lac et du Parc Grand ResortAt its narrowest point the lake is flanked by steep mountains which creates a fjord-like landscape. Mountain bikers will find spectacular routes in places such as Torbole and Arco, and sportsmen from around the world can partake in surfing, kite surfing and climbing. Older guests appreciate the hiking trails around idyllic destinations like Limone. The ridge of Monte Baldo dominates the eastern lakeshore and makes an excellent destination for active travelers in summer and winter. Hobby botanists will appreciate the region’s endemic plant diversity. The area around Bardolino is famous for wine and olive-growing, whereas Lazise is known for its theme parks. © Hotel Palazzo NovelloOnly 50 kilometers from the northern shore, the southern tip of Lake Garda provides a very different landscape. Here the banks of the lake are reminiscent of the ocean. The climate is milder, palm trees and oleander are thriving, and long beaches and campsites line the lakefront. The peninsula of Sirmione provides an insight into the lake’s Roman past and is a popular spa resort. Desenzano is another lively resort town. Around Salo and Gardone life is luxurious and delightful. 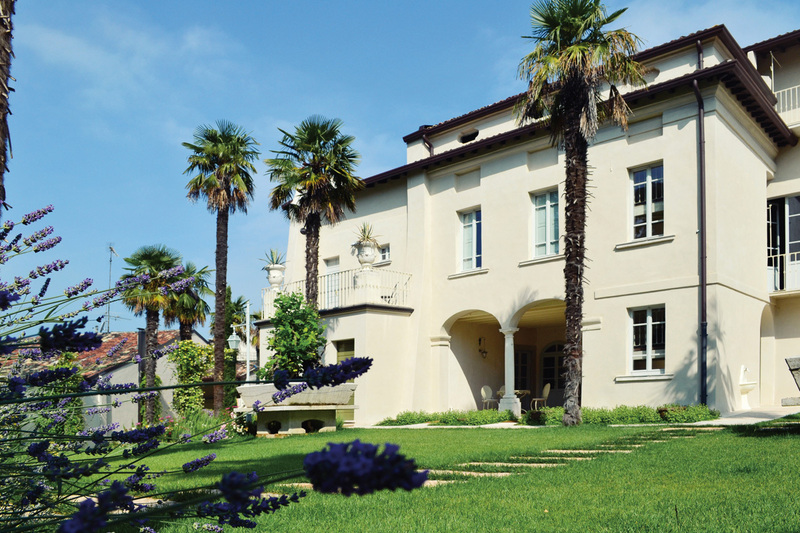 Admire luxury villas, restaurants amid lush gardens and stroll through the antique market in Gardone – this is what the Italian residents and guests who appreciate tranquility and leisure enjoy. The largest city on Lake Garda is situated in the south, but with only 20.000 inhabitants, it’s a rather small town. Thanks to one of the most beautiful waterfronts on the lake, a bustling pedestrian area and lively nightlife, you’ll find plenty to love. The town is also worth visiting for its historic sites that date back as far back as the Stone Age. On the northern shore of the lake is Riva. Once belonging to Austria and lying amidst the mountains, the town has the character of a Tyrolean vacation resort while also exuding urbane Italian charm. Visitors will enjoy the castle and the glamourous marina. However, there is another side of Riva to discover – it is a hotspot for surfers and hosts annual blogger meetings. Diverse but touristy: As different as the four shores of the lake are, as are the clientele and the atmosphere. A family that unknowingly books an apartment hotel in quiet Gardone will feel out of place as much as a mountain biker in Sirmione. However, the region’s backbone is tourism and the locals will generally do their best to make everyone feel welcome wherever they’re staying. If you want to get to know all facets of the lake you can plan a round-trip. A destination for locals: Like everywhere else in Italy, Lake Garda will be busy during school vacations. If you have a family it can be hard to work around the summer breaks, but try and avoid visiting Lake Garda in mid-August – that’s when the whole of Italy will be descending upon the lake for weekend trips. If you’re planning to visit the main attractions, try and visit on weekdays to avoid queueing for hours. Chic & stylish: Italians know how to dress well, which will become obvious on the beach or in supposedly “dress code-free” zones. Wearing flip flops to the café or in a boutique? Unthinkable for many Italians. If you want to fit in and not be a stereotypical tourist you should not be afraid to dress up, learn at least a few key phrases and order your coffee in perfect Italian. If you’re planning a church visit make sure to always cover your shoulders and possibly your knees.